Details on how to win an ebook copy of this novella at the end of the review & a link to purchase it. Fireworks are expected for South Cove, California’s Fourth of July Festival, but Coffee, Books, and More owner Jill Gardner didn’t think they would figuratively occur in her own store. Fire Chief Barry Gleason is ruthlessly wielding his power to cite every business in town, threatening to shut down stores just as the tourist season is heating up. Ironically, it is the practice burn he sets to test his volunteer firemen that results in Barry’s death, as he never escaped the fire started in his own barn. When it is discovered that Barry was dead before the actual fire, the outdoor crime scene becomes a locked-room mystery; only four volunteers were present at the time of the death. Believing that she has considerable experience at solving murder, not to mention more than her share of curiosity, Jill doesn’t hesitate to step in and question those with reasons for wanting the over-stepping fire chief dead. Not only did Barry overstep his authority, he may have crossed over into #MeToo territory. 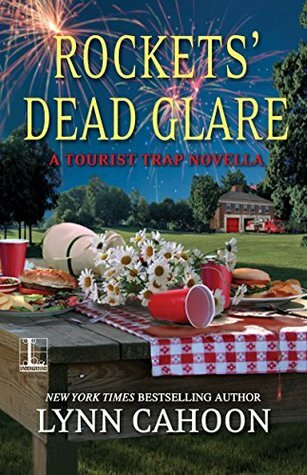 South Cove’s police detective Greg King - Jill’s very own boyfriend - isn’t thrilled to have to have her “help,” but she’s not about to allow their crucial tourist-dependent economy jeopardized by a tainted Fourth of July celebration. Jill is someone who believes in her inalienable right to poke her nose into an investigation despite her complete lack of official authority. The brilliant twist is that the author recognizes this, and delivers an ending that should delight even the most jaded of mystery readers. Jill’s talent for stress eating, appreciation of the power of gossip, and her love for South Cove make her a resilient, spunky heroine. This novella fits in a surplus of plot and surprises within its relatively short length, ensuring that fans will be hungering for even more adventures within the tourist-appeasing South Cove community. To enter to win an ebook copy of Rocket’s Dead Glare, simply email KRL at krlcontests@gmail[dot]com by replacing the [dot] with a period, and with the subject line "glare,” or comment on this article. A winner will be chosen July 7, 2018. U.S. residents only. You can read our privacy statement here if you like. I love the Tourist Trap series! I bet Independence Day is a fun time to be in South Cove. Thanks for the great review and giveaway! Wishing you a Happy 4th of July! I love Lynn Cahoon's plots thank you for the contest. You are the winner! Be sure to check your email and I hope you come back. Looks great. Thanks for the chance! I love the fireworks on the cover. Happy 4th of July! Looks like a book I should be reading today. Looking forward to reading. A perfect book for the month...thank you.